Dillano Luxurious Jewels has recently introduced their Uncut Unicus Collection. The glistening in the brilliance of uncut diamonds is showcased in stunning statement gold jewels. These distinctive designs are perfect for those who seek out unique jewellery. The striking pieces feature diamonds and precious gems in bold patterns. We think they’re perfect to make an impact on a glamorous evening out. Uncut Unicus by Dillano Luxurious Jewels showcases creativity with a blend of contemporary styles and traditional heritage. Creating depth in each piece through an emphasis on contrast via the use of coloured gemstones such as emeralds, rubies and sapphires, the collection is bold and impactful. The cuffs, bangles, rings and heavy earrings make a regal collection in yellow gold. The collection seems perfect for Indian attire or to lend an ethnic edge to an elegant dress or jumpsuit. One thing is for certain, these jewels demand you have somewhere special to go. 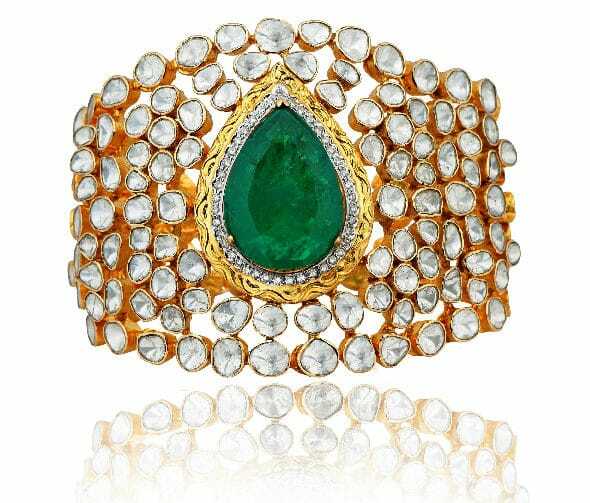 Established in the year 2008 under the leadership of jewellery designer Chitwn D Malhotra, Dilano Luxurious Jewels Pvt. Ltd is a jewellery company based in New Delhi. Primarily focussed on diamonds and gold, the brand focuses on femininity, natural beauty and ingenuity in their jewels. An alumnus of Gemmology Institute of America, Chitwn D Malhotra, Dillano’s founder and lead designer says that he has created the brand to satisfy India’s growing demand for luxury jewellery with a contemporary edge. He believes that there is a magical and an intimate connection between a woman and her jewellery and aspires to make every jewel special.